We started some new subjects this week, much to the girls delight. All of them have been huge hits! We are continuing to finish up some second grade and preschool work before diving into third and kindergarten work completely, but to make things a little different with the new school year I added in some new subjects for the girls. 1. This week Chipette started a study of mythological creatures from around the world. We discussed what a mythological creature is and how some of the stories began. Did you know that people in ancient Mesopotamia thought that a giraffe was the offspring of a camel and a leopard? We are using the Mythological Creature lapbook from In the Hand of a Child. As we study each creature Chipette is taking notes and finding or drawing pictures to make her very own Mythical Creature Field Guide the last week of our study. 2. To begin a quick introduction of world geography, which will be what our third grade year is all about, we are using Beautiful Feet’s Geography Through Literature curriculum. Right now we only working through Seabird, but will study the other books during the rest of the year. This week we placed our whaling ship on the world map and will move it each week to follow the path of Seabird in the book. 3. Chipette is most excited about the new subject of character training. We went back to doing our Bible study together, but I wanted to have some time one-on-one with the girls as well to focus on specific areas where they struggle. At the last minute I decided to add this into our rotation so I needed something easy and cheap. I found an entire character curriculum using William Bennett’s Book of Virtues, so that is what I’m using with her and she LOVES it. She loves the stories, answering the questions, and discussing how the character in the story exhibited or didn’t exhibit the virtue. 1. For Magpie we added in some literature based activities using a pdf book that I purchased during Scholastic’s Dollar Days sale called Creating Curriculum Using Children’s Picture Books. It is very similar to Five in a Row, but it clicks better with the way my mind works. 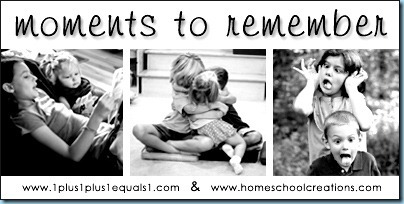 I know it is blasphemy to say this in most homeschool circles, but I did NOT like Five in a Row. This works much better for me. Before I post this next picture I want to let everyone know that I drew this bear in about five minutes. Also, this paper is only about three feet wide, so he is quite a skinny, deformed looking grizzly bear, but I tried to get his head right. Preacher Man has gotten more enjoyment out of looking at my sad, pathetic grizzly bear hanging in the dining room for the past week. Every time he walks into the room I hear him laughing at it! 1. I revamped our Circle Time this year as well. I made it more independent in some ways for the girls, which gives me more time to do some different things together at lunch. 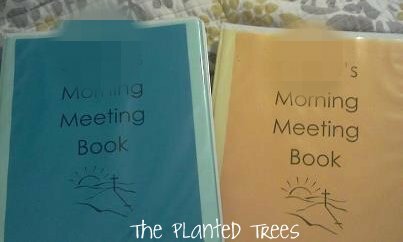 I changed the name to “Morning Meeting” and created independent books for them to use right after they finish breakfast and their morning chores. Once they finish their books, then they go to our calendar board and adjust all of the items using their notebooks if they need help. I will devote an entire post to our new system in the near future. It is working out beautifully and the girls LOVE it! It's been the biggest hit so far. 2. Because I love the curriculum so much, we went back to studying the Bible together with Bible Study Guide for All Ages this year. I cannot say enough good things about it! My children retain more Bible knowledge and facts using this than anything else we’ve ever tried. The wonderful news is that the great folks at Bible Study Guide are letting me host a giveaway for some of their products. I will be doing an in-depth review of the program and opening the giveaway later this week, so watch for that. You don’t want to miss it! Monkey wanted to join in our Spanish lessons this week, so I let him have one of my homemade Salsa Spanish worksheets. He already knows what ven aqui means because I use it so much with the girls. He’ll walk around the house saying “key, key” when he wants someone!